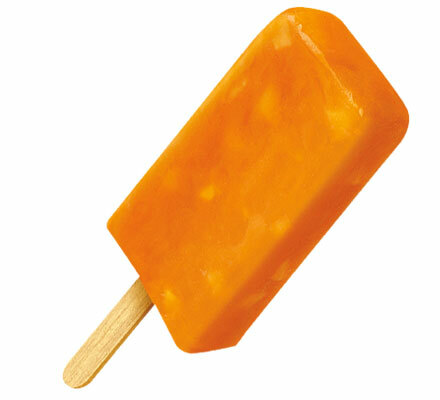 Mango fruit bar with pieces of real mango and other natural flavors. Case Dimensions: 10.8125 in. x 7.5 in. x 4.875 in. Ingredients: Water, Flavor Base (Mango Puree, Pineapple Syrup, Lemon Juice Concentrate, Passionfruit Juice Concentrate, Sugar, Water, Food Starch-Modified, Natural Flavors, Citric Acid, Turmeric and Annatto and Beta Carotene for Color), Corn Syrup, High Fructose Corn Syrup, Sugar, Contains 1% or less of Guar Gum, Cellulose Gum, Xanthan Gum. This product, when extremely cold, may stick to warm lips or tongue. Allow to warm slightly before eating.